Sunday April 5 1908 I was busy with the dinner all fornoon and getting the table ready for company. Otts family with Mother came out jist before noon. In afternoon Ott & William went up to mid-way. They all went home about five oclock. We did the evening work. I read all the evening. Monday April 6 1908 Will went early to a trustee meeting at The Brick school house. I did washing alone. Billy plowing. 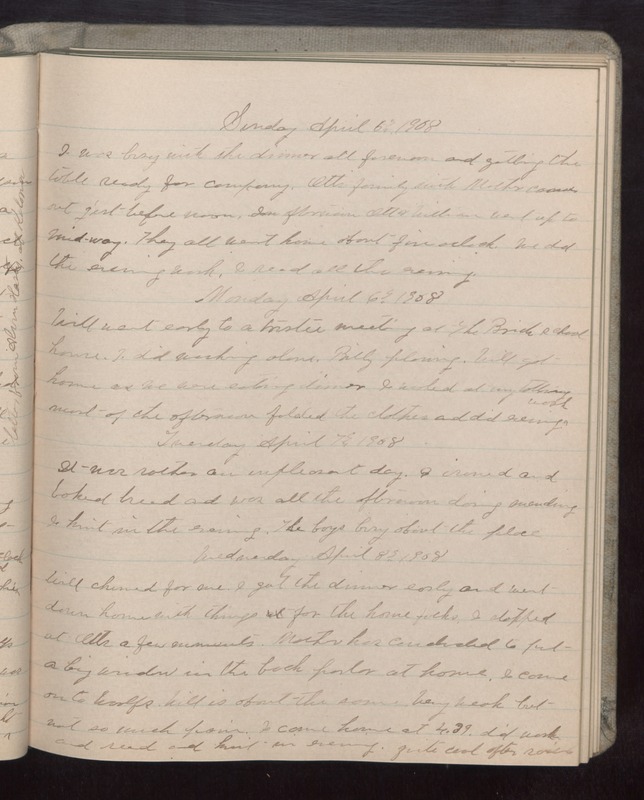 Will got home as we were eating dinner I worked at my tatting most of the afternoon folded the clothes and did evening work Tuesday April 7 1908 It was rather an unpleasant day. I ironed and baked bread and was all the afternoon doing mending I knit in the evening. The boys busy about the place. Wednesday April 8 1908 Will churned for me. I got the dinner early and went down home with things for the home folks. I stopped at Otts a few moments. Mother has [concluded?] to put a big window in the back parlor at home. I came on to Woolfs. Will is about the same. Very weak but not so much pain. I came home at 4.39, did work and read and knit in evening. quite cool after rain.